I’m back up on Cloud 9 although I only went down to Cloud 7.5 for an afternoon, waiting for paperwork to be completed. Yesterday, as it was our 28th day at the campsite, we were obliged to decamp off the site for one night. Wild camping! Ooh how exciting, how scary! I’m afraid we cheated and stayed in a local restaurant car park!! It was fabulous, as it was slap bang next to our old house. No sooner had we parked up than we had visits from neighbours and friends. It was so lovely to see them, and the kiddies from next door were fascinated by Harry, how do we sleep, how do we cook, where’s the fridge, what about the loo? Having seen the delight on their faces I realised that’s why I’m so happy here, I’m just a big kid!! I had a friend come over bringing with her a bottle of something Pink and Bubbly, I can tell you that went down a treat, as we sat, catching up, in the car park on sun chairs in the evening sun. Sounds awful but trust me it was heavenly. If I can be happy in a concrete car park I can only think I’ll be delirious if we stay in a vineyard in France!! I’m going to be hell to live with, I’m actually beginning to feel sorry for the hubster being cooped up with Little Miss Happy Pants for a year!! As the sun went down we prepared for the evening and bedtime, now of course we didn’t have mains electricity so we were reliant on the leisure battery for electricity and gas for cooking. WARNING: Techie bit coming up – well not too techie cos I’ve no idea what I’m talking about! As a result we spent a lot of last night turning lights on to see something and then turning them off just as quickly, I nearly resorted to candles at one stage but we went to bed instead. This definitely needs more research otherwise we’ll be spending the next year in the dark and come winter we’ll be going to bed at 4 in the afternoon because we’ll be too scared to use the lights. Honestly, if I’d designed this control panel there would be an alarm that would tell you to STOP!! Why didn’t the manufacturers think of this? Some kind of power thing, no doubt! Another thing we discovered last night is that our fridge, (we were told to “Just flip it over to 12 volt when you’re not plugged into mains”) yeah we did that and guess what? the whole damn thing defrosted while we slept!! Water everywhere, Ice trays defrosted, soggy mushrooms, food to chuck – so thanks for that little pearl of advice Mr Dealership Man! Harry’s fridge likes to be run on Gas according to the manual, why did I listen to the man??? Oh well, at least the fridge got a good clean out! Although I haven’t blogged for the last two days, well there isn’t a lot to report unless you want to know what we ate for lunch!! I have taken a couple of photos and had a play around. These popped up the other night and I know I probably shouldn’t say this but I found it all a bit scary!! All the red tents pitched in a line, the large, communal, dining table and even the picnic boxes were red! I’m not sure who they were but they’d left by the time we returned to the site. The red cult have set up home. 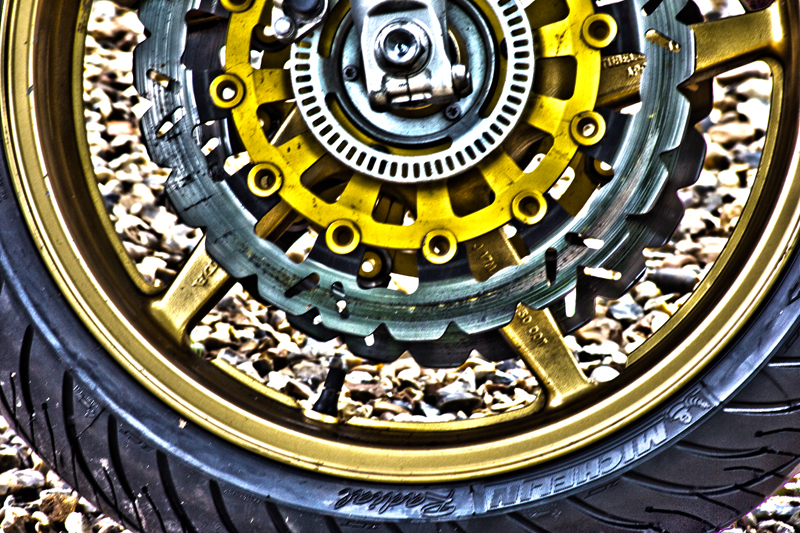 One of my camping neighbours has and cracking motorbike, I gave it a bit of HDR treatment, I really love the effect. It has a gritty, oily effect which I think suits it brilliantly. 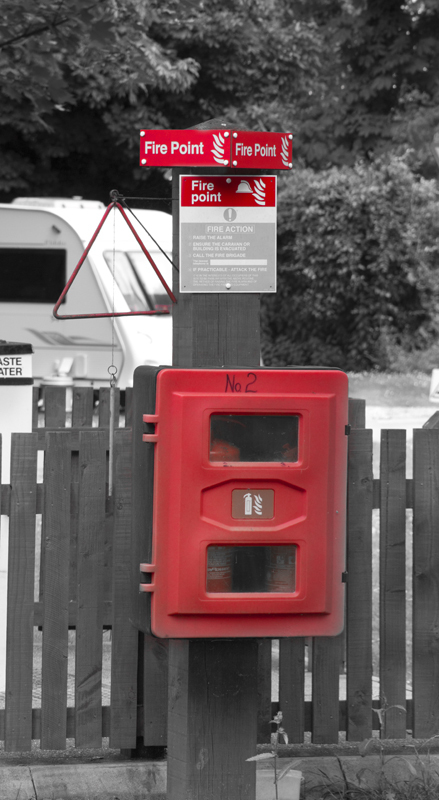 And lastly, this colour isolation image of the Fire Safety Point. I think that Colour Isolation can be overdone and I’m sure you’ll have seen endless photos of phone boxes and letterboxes (she coughs, tents!) but I think this one appealed to me as firstly it’s a different subject matter and it has the very delicate red triangle on the left of the image which draws the eye. Well that’s what I think anyway!! As I sit here now, we are experiencing the mother of all thunderstorms, Charlie is hiding in the bathroom! We had one clap of thunder and I’m sure Harry jumped!! I’m not sure how long it will go on for but I’m not overly keen on thunder and lightening so on that note I shall bid you a good night as I go and hide in the bathroom with the dog!! This entry was posted in Daily life, Dogs, England, Hidden Gypsy, Hymer, motorhome, motorhoming, Photos, Thoughts, Uncategorized and tagged campsite, Dogs, England, happiness, hidden gypsy, Hymer, leisure battery, motorhome, motorhome batteries, motorhoming, river thames, tents, wild camping. Bookmark the permalink. ← The need for peace. Oh Michelle! Loving reading your blog. Every day is an adventure! Yes the last place I thought I would think I’d be happy sleeping – the car park of all places!! Must have been nice to spend some time with old friends for an evening. Oh Colline you are so right, there is nothing better than catching up with friends. Priceless! Hi loving the blog and your news. Sorry about the fridge did you get a manual at all? Glad your back on the site but do hope you have some positive news soon. Hi there, yes it’s great to be back but need to be back over on the other side, too many mozzies and birds over here!! As for the Fridge the answer is Yes in German!! We’ve had to book in for another week so we’ve asked for a hardstanding with no trees! Bless they’ve been ever so busy. But I’m looking forward to a week with no bird or duck poo! !